← New Tyres (And Pants!) Required! Last year (2012), we had a bit of snow. Not vast amounts, but enough to make the whole of the UK grind to a halt. Well, those who didn't have a 4x4 vehicle, anyway. At the time, Murpha was running a standard non-turbo 2.5-litre diesel engine. Even in the summer, that engine never heated up. In the winter, it was as if the temperature gauge had frozen on zero! I wasn't overly worried about the engine, but it meant that what little heat I used to be able to wring out of the lame in-car heater was totally non-existent once the outside temperature dropped anywhere near zero. With that in mind, I decided that Murpha needed a muff. All a muff is, as you'll see from this photo, is a vinyl cover that covers the radiator grill, thus reducing air flow to the radiator. You can get various makes, but make sure you get one to fit your own particular model. I got mine from eBay for about £30. Fitting is a doddle – you just cable-tie it on. No mechanical skill required whatsoever. In warmer times, the centre of the muff rolls up and clips in place like that with the use of the poppers. Just roll it down and pop into place when it's cold (or, perhaps, if you plan splashing through a lot of water!). This did actually make a big difference and, to me, it was £30 well spent. 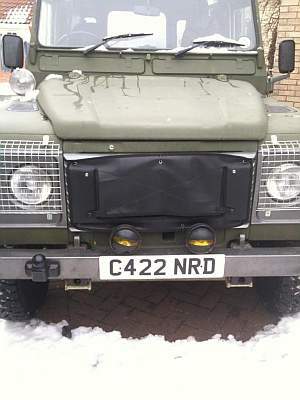 If I'm honest, too, I think it gives my Land Rover a more 'interesting' appearance, too. To me, Murpha is about enjoyment, as well as being a utility vehicle, so things like that matter. Recently, I've had a 200tdi engine fitted, which seems to run a bit warmer. I'm not sure, therefore, whether I'll need the muff. However, with snow forecast for next week, I'm in no rush to remove it.